Sunda Strait, the small stretch of water between the islands of Sumatra and Java was the scene of a number of naval engagements in February and March 1942. In late February 1942, Japanese amphibious forces were preparing to invade Java, in the Netherlands East Indies. On February 27, An Allied force of five cruisers and nine destroyers engaged the Japanese in the Java Sea. 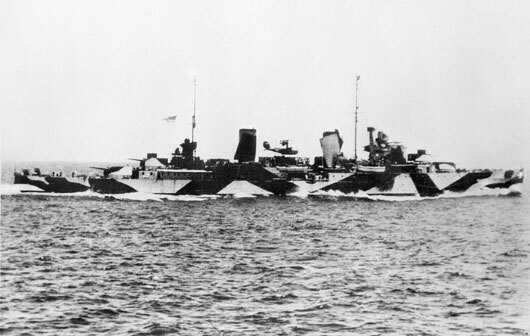 Two Dutch cruisers and four destroyers were sunk. The USS Houston and HMAS Perth both retreated to Tanjung Priok, Java, the main port of Batavia (now Jakarta), where they arrived at 1:30 pm on 28 February. Later that day, Houston and Perth received orders to sail through Sunda Strait to Tjilatjap, on the south coast of Java. By chance, just after 10:00 pm, the Japanese 16th Army’s Western Java Invasion Convoy – over 50 transports, and including the Army’s commander, Lt Gen. Hitoshi Imamura – was entering Bantam Bay, near the northwest tip of Java. The Japanese troop transports were escorted by the 5th Destroyer Flotilla, led by Rear Admiral Kenzaburo Hara and the 7th Cruiser Squadron, under R. Adm. Takeo Kurita. As the Perth and the Houston approached the entrance to Sunda Strait at 11 pm they were spotted by a Japanese destroyer and both cruisers went to action stations and opened fire. For an hour they engaged the Japanese but were outnumbered and both cruisers were sunk. On HMAS Perth, 350 men including the ship’s captain, were lost in action. Those who survived became prisoners of war. On 4 March 1942, south of Java and heading for Freemantle, HMAS Yarra was escorting three ships when attacked by a Japanese force of three heavy cruisers and two destroyers. All four ships were sunk and only 13 of Yarra’s crew were rescued. 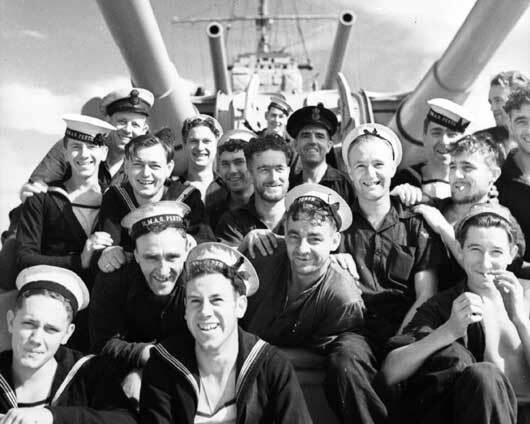 A group of happy crewmembers relaxing on HMAS Perth (AWM 006846). 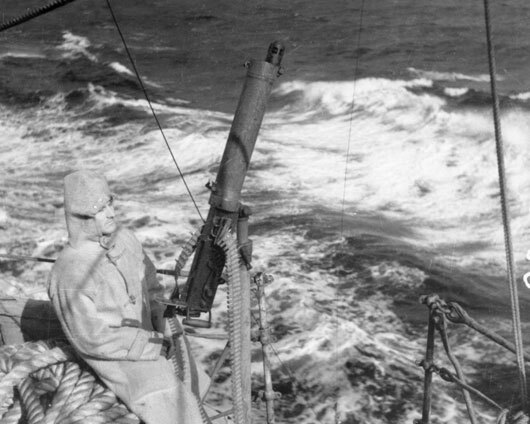 Petty Officer "Nutty" Ferris, ready for action with his Vickers machine gun aboard HMAS Perth (AWM 006855). 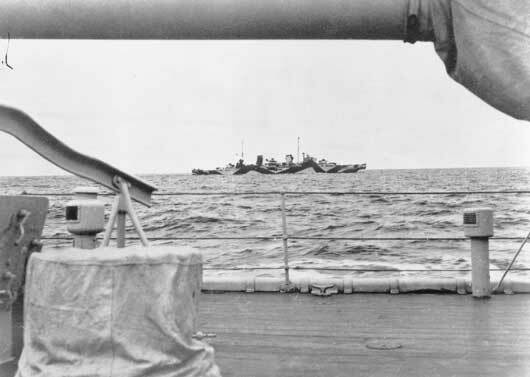 A view of HMAS Perth, taken from HMAS Adelaide as the Perth proceeds northward to join allied naval forces in the Netherlands East Indies (AWM 128105). A starboard side view of HMAS Perth, showing its camouflage scheme (AWM 301160). 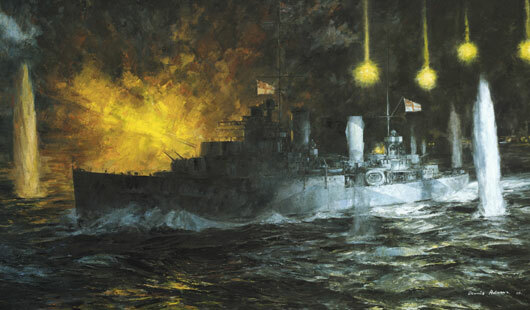 Murray Griffin, "HMAS Perth fights to the last, 28th February, 1942" (AWM ART24483). 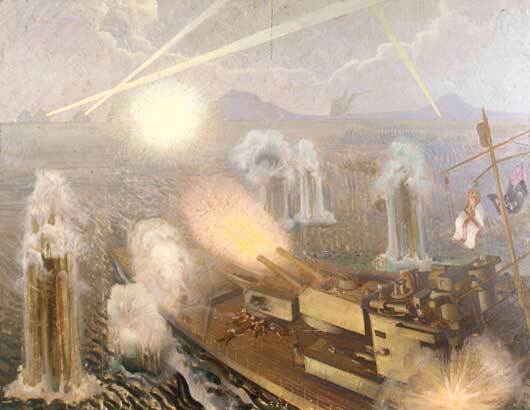 Dennis Adams, "HMAS Perth in the Battle of Sunda Strait" (AWM ART27557). 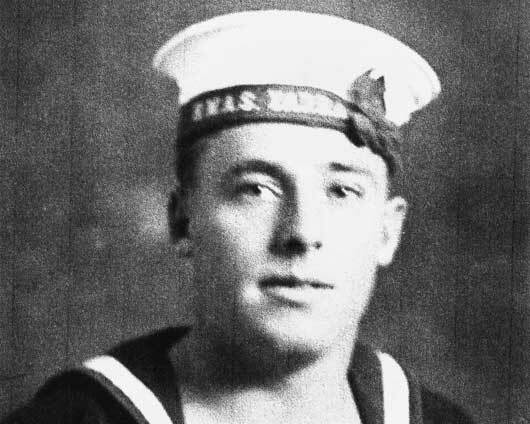 Leading Seaman Ron Taylor of HMAS Yarra II, who was killed in action on 4 March 1942 during an attack by a Convoy of Japanese warships south of Java (AWM P03791.002).